Today I thought about migrating Apricum to Swift as I did remember the WWDC announcement saying it’s about 50% faster than Objective-C. I rewrote the necessary parts (just 3 classes) of the Apricum patch programming core in Swift and tested a simple add patch with 1000 different input values (two random numbers for input a and b). The Objective-C version (which uses the Apricum Core framework) took 0.0087s and the Swift version (not nearly as big as the Apricum framework) took 0.0211s. I’m not saying that this is a good test as both versions are quite different so I made two similar versions and compared them. 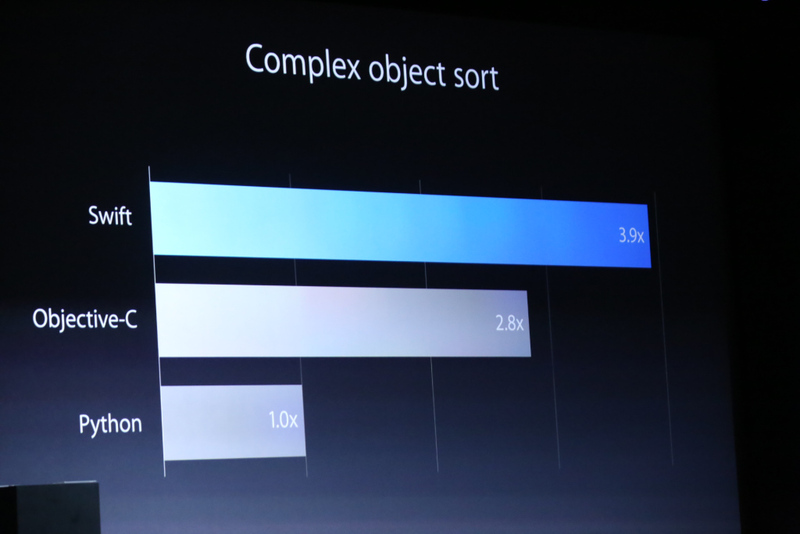 Now Objective-C took 4.1378s and Swift 4.3653s, which doesn’t seem like a big difference. But Swift doesn’t have dynamic method calls (well it supports the target/actions, but only by using Objective-C) unlike Objective-C where every call to a NSObject is a dynamic method call. Additionally the freedom to choose whether you check objects for nil or just call a method is far, far better than those nested ‘if let’ checks you see all over Swift code. Most of the time the code I’ve read ends up using var xyz: ExampleType! which is even worse, as it’ll end up crashing your app if xyz isn’t set somehow, which although it should not happen, might happen. Another part I really dislike is the lack of backward compatibility in Swift. While programming Objective-C, it happened once, that a change has been made that needed code changes. That was the migration to ARC, where you can still (to this day) mix ARC code with non-ARC code. The complete opposite is Swift, where changes are frequent and mandatory. I was working on a project and over night Xcode updated to version 7.0 with a slightly different Swift syntax, making it necessary to change small parts all over the project (Fortunately one team member already did change most parts to the new syntax). This incident drove me away from using Swift for big projects, as I can compile more than 5 year old Objective-C code, but can’t compile Swift code I wrote a few months ago.